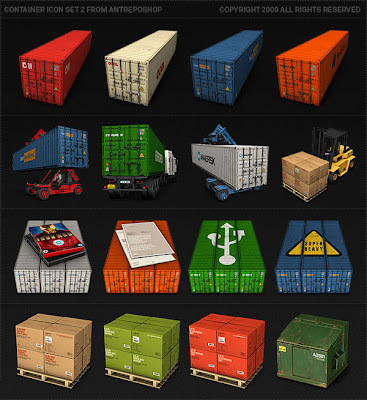 New Container Icon Set from antrepo, another 40 icons about colorful big metal box. It's compatible with any Mac Os system, also compatible with Windows XP and Windows Vista. It is freeware. Download it, share it, use it ! Mac icons is include at least the 16x16, 32x32, 128x128, and 512x512 pixel resources for each icon. The 512x512 size is for use with Mac OS X 10.5 Leopard and later. Windows Icons is include at least the 16x16, 32x32, 128x128, and 256x256 pixel resources for each icon. The Full icon set preview is here. The First Container Icon set is here. The Third Container Icon set is here. The Fourth Container Icon set is here. Icons look great. Just wish I could download them. Your file server site thing will not let me download both the first and second set within 15 min of each other. And the link seems to be broken as it only downloads the first set. all links works great now. We check it. Seconded; Like Seth, I think a cargo ship with the containers on it would look awesome. Please do some ! ?